TAUNTON, Mass. – If you needed any proof that the final score doesn’t always reflect how the game was played, look no further than Franklin’s 2-0 win on the road at Taunton. 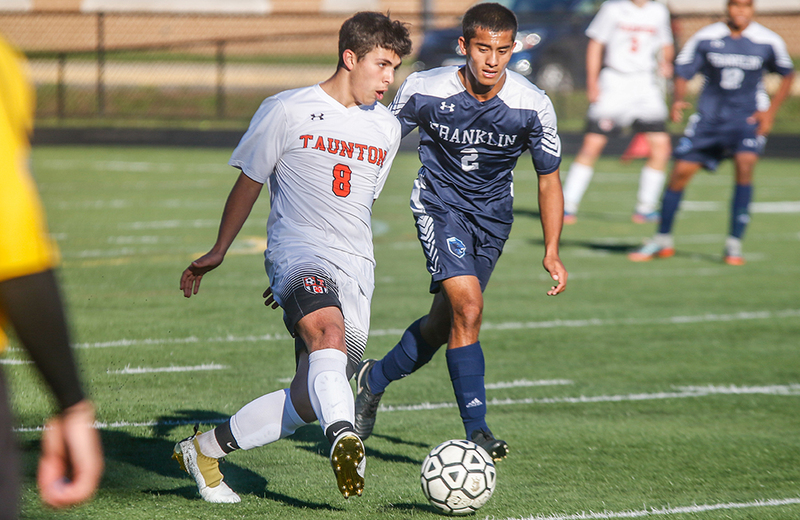 Despite playing arguably its best game of the season, and creating nearly a dozen good scoring chances, Taunton couldn’t find a way to find the back of the net. And Franklin, who was on the defensive for a solid hour of the game, weathered the storm and push from the Tigers, evened the play over the final 20 minutes of the game and netted both of its goals in that same span. “We were very fortunate,” said Franklin head coach Fran Bositis. “We should have down maybe four goals at halftime. They outplayed us in the first half completely. 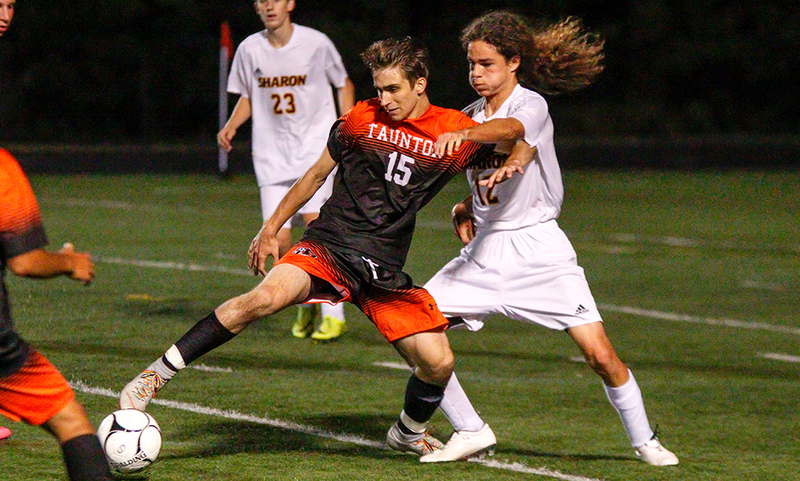 After a free kick chance early for the Panthers, it was all Taunton for the next 35-plus minutes. In the fourth minute, sophomore Alec Nunes split his way between two Panthers defenders before centering a pass to junior Evan Melo. Melo had a go from outside the area but his bid was comfortably saved by Franklin keeper Freddie Beckmann on the bounce. Just seven minutes later, Taunton senior Jake DeAndrade played junior Brett Beaulieu down the wing. Junior Kyle Aubin was on the end of the cross but his shot went just wide. Taunton center back Derek DeSantis plays a long ball over the top in the 18th minute with Beaulieu tracking down and sending a cross to the far post. Senior Liam Crowley had his shot blocked with the rebound falling to Aubin, but his low shot was pushed aside on a diving save from Beckmann. Nunes had a bid in the 31st minute when Beaulieu centered a pass on the turf, and Nunes latched onto it at the top of the area but his hard shot skidded wide at the far post. Two minutes later, Beaulieu found Melo but his header at the back stick was wide as well. Franklin had one chance in the final minute of the half when Nitin Chaudhury and Liam Kapples combined at midfield with the result springing Kapples free. However, DeAndrade did well to track back and his slide tackle blocked Kapples’ bid inside the area. The Panthers also had the first chance of the second half but Andrew DiLeo’s shot was tipped wide by Taunton keeper Nolan Melo for a corner. Taunton kept the pressure up to after that chance but still couldn’t find the back of the net. Nunes sprayed a pass wide to Crowley, who whipped a cross to the far post but Beaulieu’s effort to center the ball again was smothered by Beckmann. Two minutes later, Nunes found Crowley again, who linked up with Aubin in the middle, but his bid went wide as he was pressured heavily by Franklin’s center backs. Inside the same minute, junior Liam Crowley stepped into a shot from atop the area, but it was wide. In the 49th minute, Nunes’ free kick went right at Beckmann, and in the 53rd minute, Nunes’ corner was headed by Daeshawn Duffie but Aubin’s half-volley attempt just looped over Beckmann and the bar. DeAndrade, pushed up to an attacking spot, found his classmate Crowley on the left side but his chance from a touch angle went wide at the near post. “I felt like we were outplaying them for about a good hour, and especially in the first half,” said THS head coach Taylor Whitters. “We just didn’t finish, and that’s how you win games. You have to finish. Once the hour mark struck, the Panthers seemed to settle in and their pressure helped create chances. 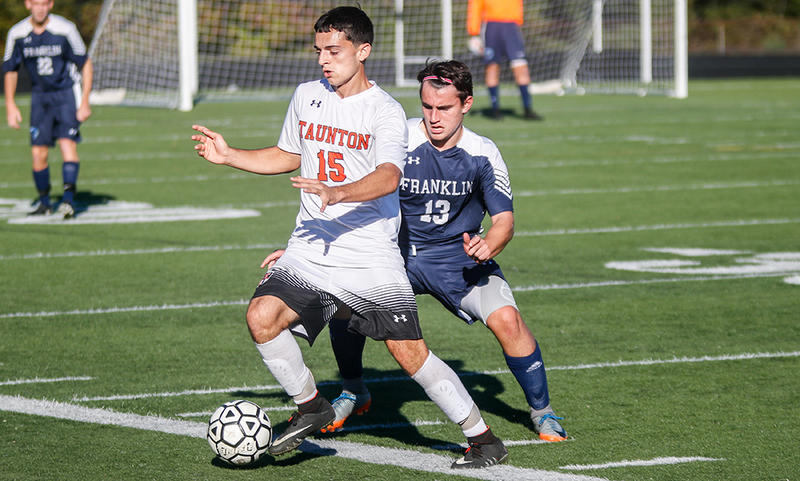 While the majority of play took place in Taunton’s attacking third up until this point, Franklin’s pressure suddenly made it a challenge for the Tigers’ defense to get out of its own defensive third. In the 61st minute, Jacob Cummings played Chaudhury wide and he found Tim Duval inside the area, but his point black shot was knocked down Melo and eventually cleared. Franklin finally broke through in the 68th minute on the counter-attack. Kapples sprayed a pass wide for sophomore Donny Tappin. Tappin cut back inside the area to create some space before placing a shot on target. It was nearly stopped by a Taunton defender but found its way into the back of the net for a 1-0 lead. A minute before the Panthers officially made it 2-0, Franklin had a golden chance denied by Melo. Beckmann launched a long punt that bounced over the defender with Tappin running onto it, but his shot was turned away by the Taunton keeper. However, a minute later, a blocked clearance went looped right to Chaudhury at the back post, and he headed his shot just over the line before Taunton’s defense could clear it. Taunton had one final chance in the 77th minute when Beaulieu connected with Crowley on the left wing, but his bid at the near post was tipped over by Beckmann. “We’ve been competing a lot more this season, and we’re giving some teams a run for their money…but if you can’t finish…you know, goals win games, simple as that,” Whitters said. Franklin boys soccer (5-7-3 overall, 5-6-2 Hockomock) will try to continue to keep its postseason hopes alive when it travels to Mansfield on Thursday. Taunton (2-11-2, 1-10-2) will look to bounce back when it hits the road to visit King Philip on the same day.